Do you know what most real estate ads have in common? Empty words. It doesn't seem to matter if homes are at the high end or the low end, their ads are filled with words that really have no clear meaning. Worse, they're words that don't evoke any kind of emotional response in the people reading them. There exists an entire set of words so generalized that they can mean something different to each of us. 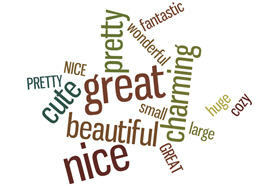 Consider the meaning of words such as "wonderful, beautiful, cozy, charming, lovely, cute, large, huge and great." I call them the "empty" words because they serve no purpose except to take up space.And this set of words takes up a LOT of space in real estate ads. I think back to a conversation I overheard in my real estate office one day. The agent was describing a property to a buyer and said that it had "beautiful trees." The woman glared at him and said "The only beautiful tree is a dead one." Her definition definitely didn't match the agent's - or mine. It wouldn't have mattered to that woman, but what he should have said was that the property had pine trees, or tall tamaracks, or an apple orchard. Replacing those empty words with picture-provoking descriptions does take a bit of extra work, especially when space is limited. But you can do it! If your ads are boring, give them a makeover with some specifics. How? By replacing those empty words with real descriptions. If something is "great" say what makes it great. If it's "large" or "small" tell its size. If it's "nice" say what's nice about it. If it's "charming" talk about the features that make it charming. There's a real estate flyer laying on my desk right now. One of the ads says the house has a "great fenced yard." What does that mean? To me, it might mean a 5' tall chain link fence that would keep the dogs from running out into the street. To someone else it might mean a 3' tall 2-rail cedar fence that serves to keep neighborhood kids from riding their bikes through the rose beds. So start thinking about details - words that actually describe something. Then use them. One more tip - Get a recorder! Some of your best advertising ideas will come while you've got your hands on a steering wheel, so get a hand-held recorder and put it on your car seat. As soon as an idea hits you, record it. It may need to be polished, but at least it won't get lost. P.S. When you need real estate prospecting letters, be sure to visit my Prospecting Letters Page. You'll find a variety of letters for every kind of seller - and some buyers as well.